I did not know what to expect when I was contacted to review several products from Fischer Pharmaceuticals, or as it is simply known throughout the world, Dr. Fischer. I was amazingly surprised at what I received.Every product was above my expectations, with my favorite being the baby wipes! The sensitive baby wipes are amazing! They have this light scent, but clean better than any other wipes I have used! These work so well that I definitely use less wipes, and plan to continue purchasing these for my little guy and his sensitive bottom. My husband had no idea that these wipes were for review and he commented about how well they cleaned, and he loved the fresh scent! 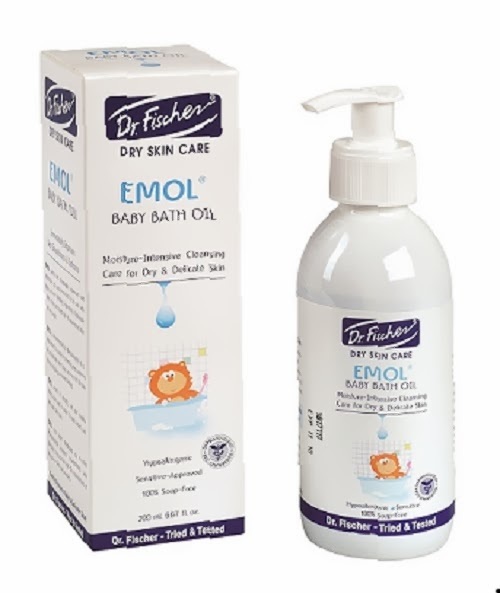 The Emol baby bath oil is perfect for both my son and me. We add just a few squirts to the bath and our skin is well hydrated and feeling smooth after bath time. I have noticed both if my sons and I have used less lotion since we began using the Emol baby oil a couple weeks ago. It does not have much of a scent, but it is very refreshing and relaxing! My littlest guy gets rough patches on his knees from crawling everywhere, but I've noticed a significant decrease in the roughness since using the Baby Bath Oil. This is my new eye makeup remover. They are used for everyday care of the eyelids and eyelashes, and they work far better than other product I have purchased to remove my makeup. They leave my skin feeling very clean, without drying it out. When I first had my son and did not know much about being a Mommy, my own mother stressed to me the importance of keeping baby's little eyes clean. She pointed out that if you do not wash your own face, the oils cause your eyes to burn! This is true, so I am religious about washing his eyes every morning. 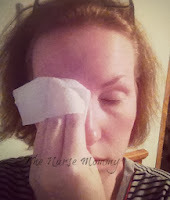 I use to dirty up many wash cloths daily doing this, but now with the Eye Care for Baby, I do not have to do that! It is very gentle on his eyes, but cleans them incredibly well! Dr. Fischer Kamil Blue Moisturizing Soapless Soap- This is a wonderful product! When used with the Baby Bath Oil, my little man needs NO other moisturizers! His skin remains incredibly clean and fresh but also well hydrated! Hey, a clean baby is a happy baby, right?? Maybe not, but a clean baby is a happy mommy in our house! Dr. Fischer is a brand I had not heard of before this review, but I am so happy that I have now! The quality of every single product we received is amazing. I even got samples of lotions and face creams, and I love them more than the really expensive lotions I currently own! I will definitely be looking into purchasing the full-sized versions! They have made me a fan for life! 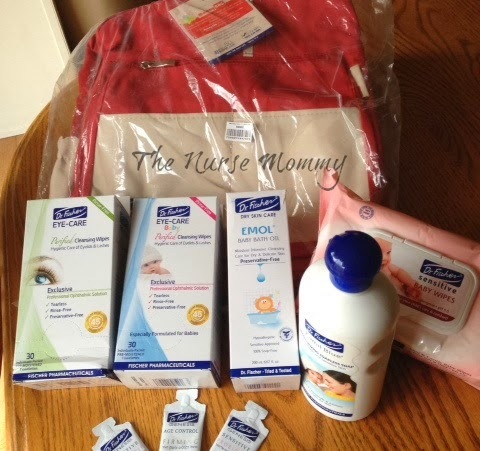 All of these products came in a neat backpack-style mommy bag. Win It: Would you like to win your own bag with all products listed above (a $75 value)? If you have won this prize on another blog you are ineligible to win again. Danielle F - I entered the Rosy Cheeks Teething Necklace giveaway. I learned Dr. Fischer products moisturize! I learned that they offer a wide range of products, including baby care products. His products are the latest advances in sunscreen technology and cover a broad spectrum. I would love to try these awesome products. International markets extend throughout Europe, North America and the Middle East where products can be found either under the Dr. Fischer brand or as customized private label merchandise. I also entered the Win a Tidy Books Kids Bookshelf giveaway. wow. i am amazed at all their sensitive skin products, and shocked i didnt know about them sooner! Fischer Pharmaceuticals is a world leader in the development and manufacture of advanced health care preparations in the fields of dermatology, ophthalmology and nutraceuticals. Looks like products I would love to use. I learned that they have products for sensitive skin.